What kind of truck do you drive at work? A special thank you goes out to Houston Community College for allowing our Recruiters into your home to help promote our department. We had a great turn out today and we hope to see you at the next recruiting event. We have quite a few fathers and sons, mothers and daughters, even grandparents and grand kids on the department. It's a great place to work and it shows. The Houston Chronicle wrote an interesting piece and shot some video regarding the Mounted Patrol. Thank you for the story. Click the post title above, to go directly to the story. Become part of something larger than yourself. 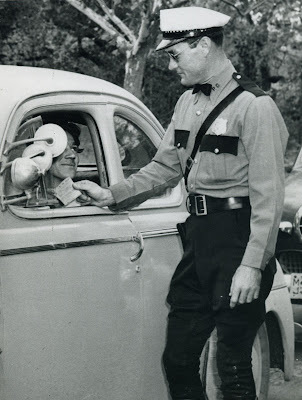 It seems that traffic tickets have been around a long time. 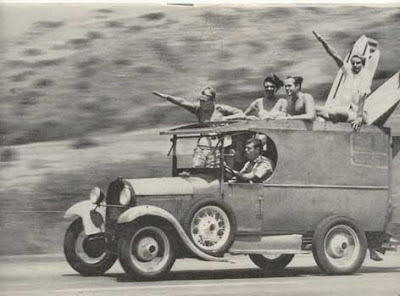 I came across another old photo and I had to smile, mostly because of the driver's smile. Oh, and the bow tie on the officer. Boy have things changed over the years. One proud father, one excited daughter. Congratulations to both of you. 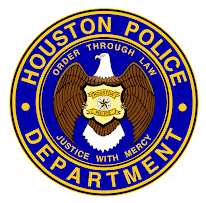 The Houston Police Department has many stories of heroism. Houston Police Officer Eric Fagan, a 23 year veteran, works right here in our Recruiting Unit. He is a friend, co-worker, and will always greet you with a hearty hello and a smile. Who knew that he received the Officer of the Year Award, not once, not twice, but three times! To receive it one time, is an extreme and rare honor with a department as large as ours, but to receive it THREE times... He was honored once for saving a six month old baby's life, once for gathering food and clothes for people who were victims of an apartment fire and a third time for arresting a capitol murder suspect. 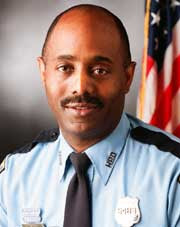 He has also received a commendation from the National Organization for Black Law Enforcement. Officer Fagan is a selfless individual who always puts others above himself, working hard to truly better his community and this unit. Once you apply to become a Houston Police Officer, you may very well get this officer as your investigator, say hello to him and give him a pat on the back, he deserves it. As a Houston Police Officer, you too, can become a real hero like Officer Fagan. I promise you that there is never a better feeling than when you make a difference in someones life like Officer Fagan continues to do. 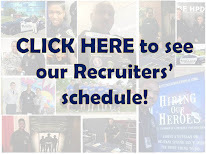 Now is the time to join the Houston Police Department. 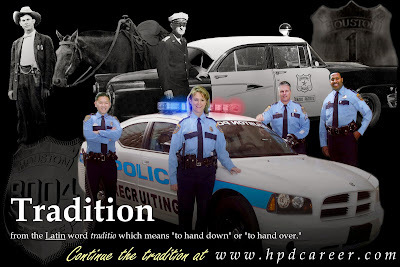 Just go to www.hpdcareer.com and start your application process. Heroes start here! Way to Go 1-9-5 !!! 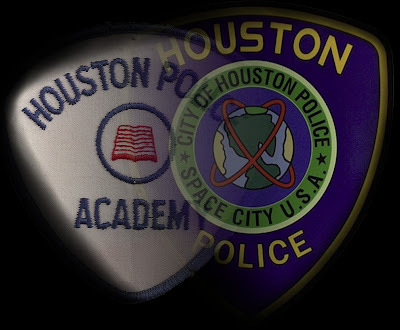 Academy Class 195 graduated last night. We will be putting 46 more men and women on the streets. Everyone looked sharp and ready to go. I will be posting some small video clips in the next few days, so check back often. I will try to post several times a week. Remember, we have room for you. We have Academy seats with your name on them. Apply today. Local Channel 39 interviewed one of our recruiters last week and aired it last night. We appreciate the nice story. The Astro's are back in swing and baseball season is here. I came across this old HPD baseball team photo and I thought I would share. I am not sure of the year, but by the look of the gloves, maybe 1940's or early 50's. 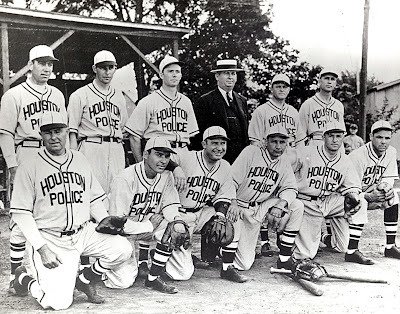 It seems the Houston police department has always had sport teams, whether it be softball, football, basketball or even bowling. That's what HPD is about, camaraderie. 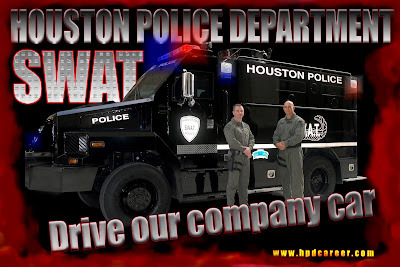 You will never find a better brotherhood than being part of the Houston police department. Every year, the State of Texas, puts on the Police Olympics. You can compete in just about anything you want. Join today and become a part of a winning team and bring home the gold for Houston. This picture was emailed to me by one of our K-9 handlers. This is Alpos one of our K-9 heroes while attending a training event. Alpos decided to jump up on the hood of one of the old police cars for a pose. What a ham. Hello Everyone at Blinn College in Brenham, Texas! I just wanted to thank everyone at Blinn College for your hospitality towards me yesterday. I enjoyed speaking with each and everyone of you. I enjoyed telling stories, showing the videos and answering questions about police work. Remember, when you get your sixty hours, give us a shout! If you have individual questions, you can always email me at officermccoy@gmail. Thanks again and I am looking forward to seeing all of you in blue one day! If you are a college or high school and you would like a recruiting officer to talk with your class please shoot me an email and we will accomodate you as soon as possible. Under the search engine on the youtube site, type in officermccoy (one word, no space ) and you will see all current videos on youtube. Look back for new pictures and desktop images in the future.